Once you use this easy hollandaise sauce recipe, you will never use a blender or a complicated method again. Rich, creamy and perfectly tart. Nothing beats homemade hollandaise sauce from scratch. 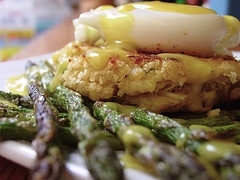 The photo is a poached egg over a crab cake with hollandaise sauce and roast asparagus; recipes below. Mix egg yolks and lemon juice in a pan and add 1 stick of the butter. Stir over low heat until butter is melted. Add the other stick of butter and stir until melted and thick. In reheating, if there is any separation, add a little more lemon juice. This is a lighter version of hollandaise sauce. Cook mixture in a double boiler over simmering water until thickened. Do not cook this too fast or it will curdle. Add butter, 1/2 tsp salt (if using salted butter, do not use) and nutmeg. May be reheated carefully. See photo above. Each muffin half serves one. Place each toasted/buttered muffin half on a plate (4 plates). Top with crab cake, then egg and top with hollandaise sauce. Serve with roasted asparagus. This is so good. Lightly mix all ingredients together and form into patties and place on a plate. Put the patties in the freezer for 30 minutes to chill. If they are not in patties the meat will warm up when you form them. This will also help them not fall apart when turning over. Heat some olive oil on the bottom of a cast iron pan or heavy skillet. Make certain they are golden brown before carefully flipping (use your other hand to hold cake). Continue to cook until the other side is golden brown. Serve with lemon wedges. Cut off the woody bottom of the asparagus stalks and discard. Peel approximately 2-3" off the bottom of the stalk so it doesn't become stringy. Put the olive oil in a resealable bag and add the asparagus. Shake until all the pieces are equally coated and put on the foil lined cookie sheet. Sprinkle with kosher salt and roast for 15-25 minutes depending how tender you want it.